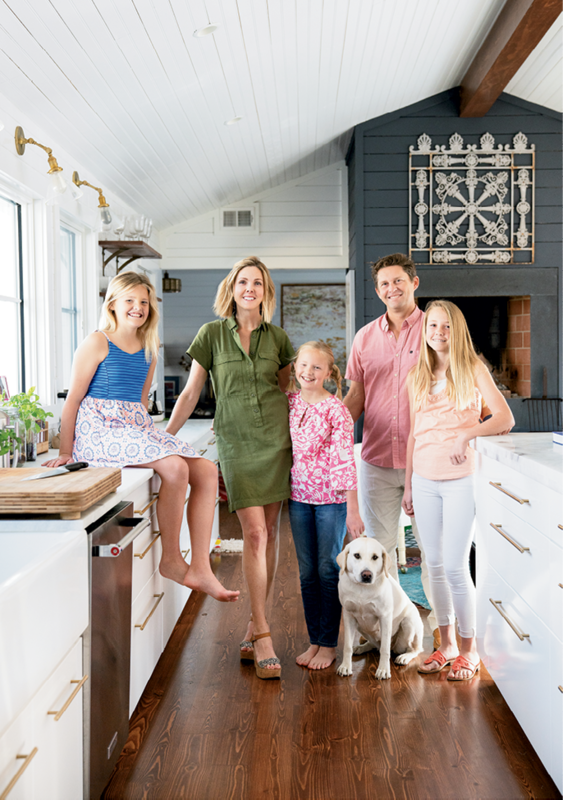 “We live two blocks from the best seafood around,” says Carrie Morey, who sends her daughters, Caroline, Cate, and Sarah to Shem Creek to buy shrimp. Rice with poblano peppers, shrimp spread with cilantro pesto, and spicy okra kick up the heat. 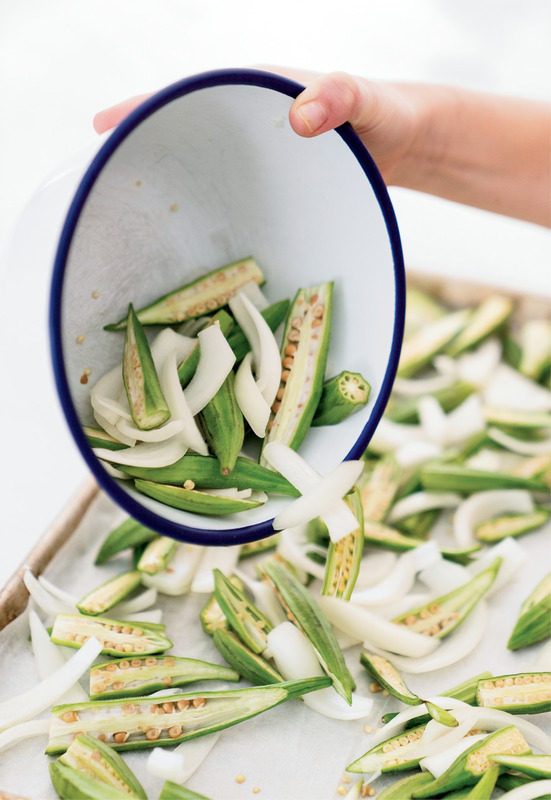 For the roasted okra, onions are added to the halved pods. After roasting in the oven, the dish is spiced up with cumin, chili powder, and cilantro. Many hands make light work—especially when mixing fresh, chopped produce into this bake. 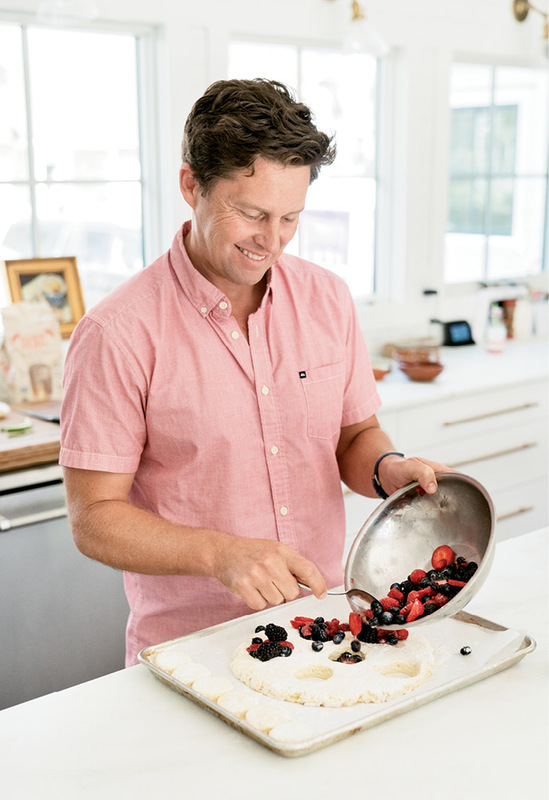 “When we get into a rut, I ask the children to give me a country—Mexico, Italy, China—as a jumping-off point for a dinner plan,” says Morey. 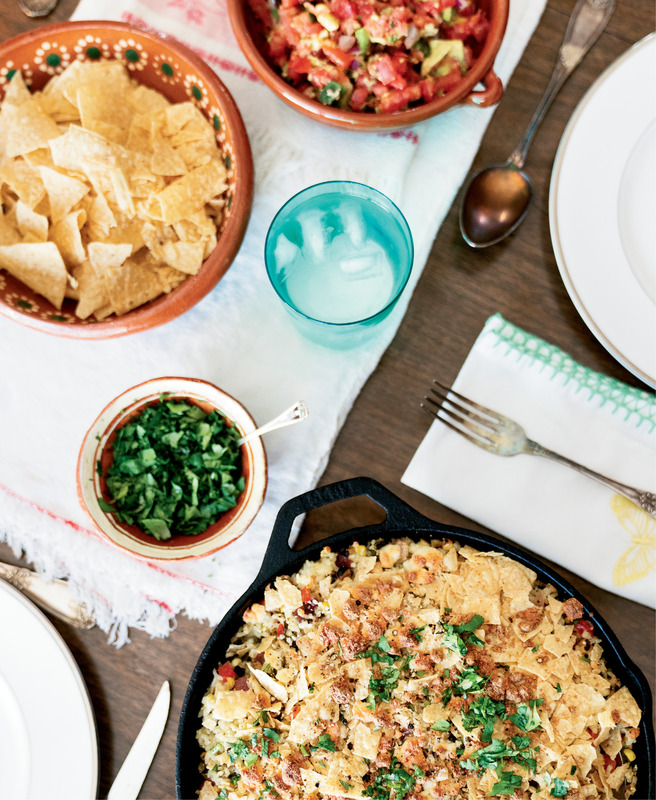 Poblano peppers pop in this Mexican-inspired corn and rice dish. On Sundays, the Moreys make a point of gathering around the table for supper and conversation. This tradition helps the busy family unwind and reconnect before the start of the week. The berry-filled biscuits are served with whipped cream (above), but topping them with vanilla ice cream is also delicious. For extra-sweet berries, let the fruit soak in a mix of sugar and cinnamon. 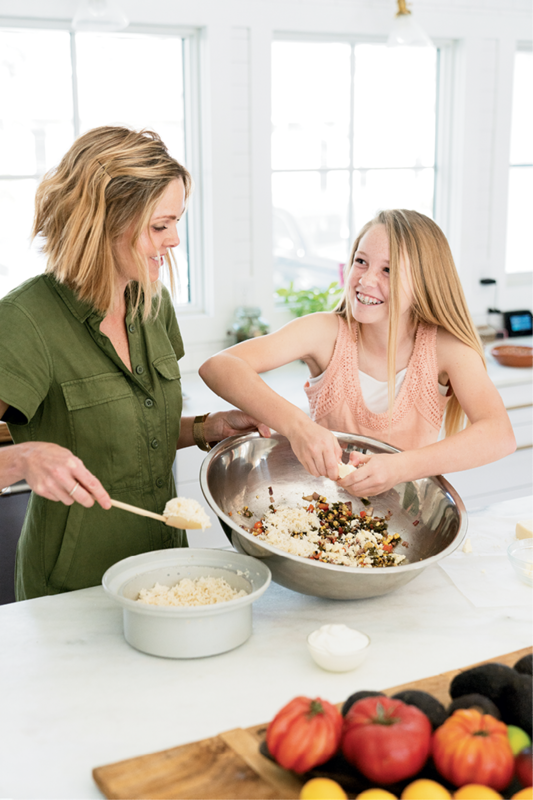 As a teen, Morey worked alongside her mother, Callie White, in a catering kitchen, baking the popular country ham biscuits that would one day give rise to a delicious mail-order craze. Shortly after her oldest daughter turned one in 2005, Morey took a leap, launching Callie’s Charleston Biscuits. “I wanted to stay home as a mom but also fuel my own creativity,” she says. Thanks to an online ordering system, Morey had more flexibility, which allowed her to bake close to home and then ship the biscuits to customers around the country. 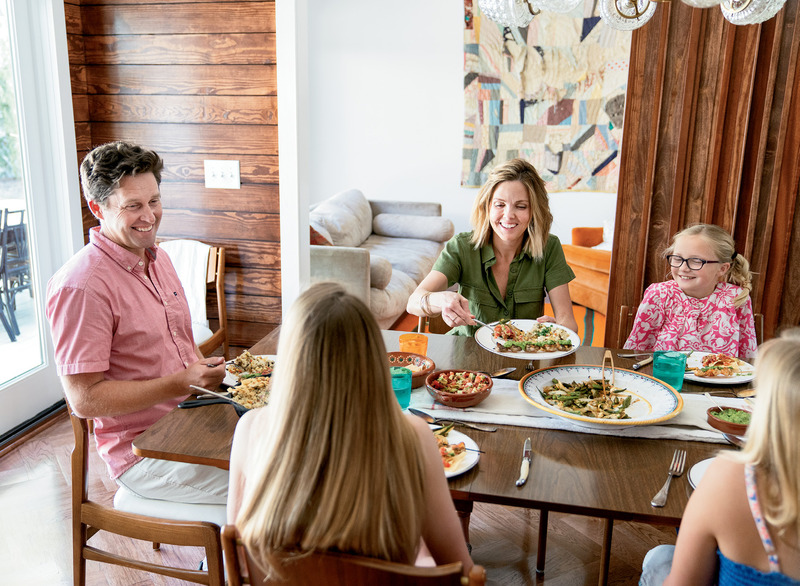 That double duty includes preparing a home-cooked meal for her husband, John, and daughters five nights weekly, even if soccer practices and work sometimes stagger dining times. 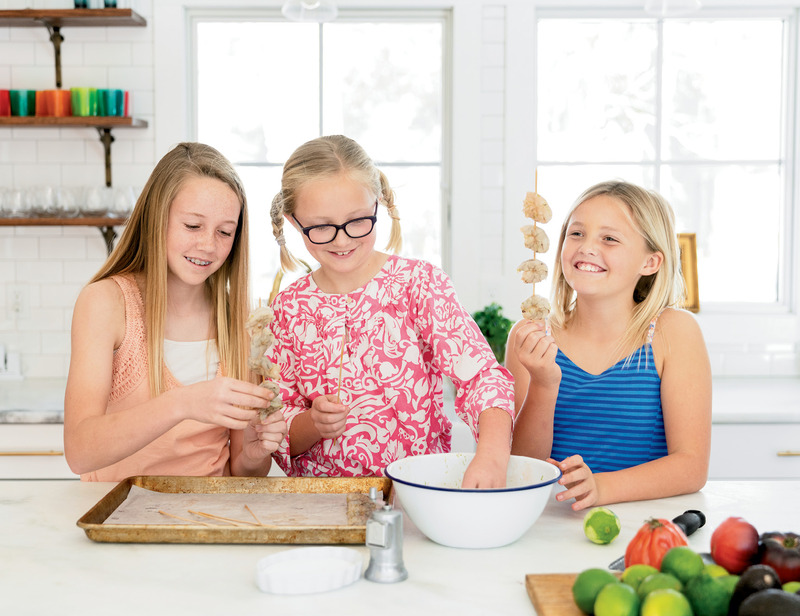 Morey likes to send Caroline (12), Cate (10), and Sarah (nine) on their bikes down to Magwood Seafood in Shem Creek for fresh shrimp, which she then soaks in a simple marinade of lime zest and olive oil. For weeknight ease, she serves the tangy grilled shrimp with pico de gallo and cilantro pesto made with pumpkin seeds and cotija cheese. “Our girls love condiments, but we try to expand their horizons beyond just ketchup with pesto, chimichurri, and aioli,” notes Morey. To encourage her daughters’ maturing palates, Morey doesn’t hold back on spice, especially when it comes to the foods her children crave. “My cheesy bake of roasted poblanos, corn, and rice is an example of me pushing their boundaries. 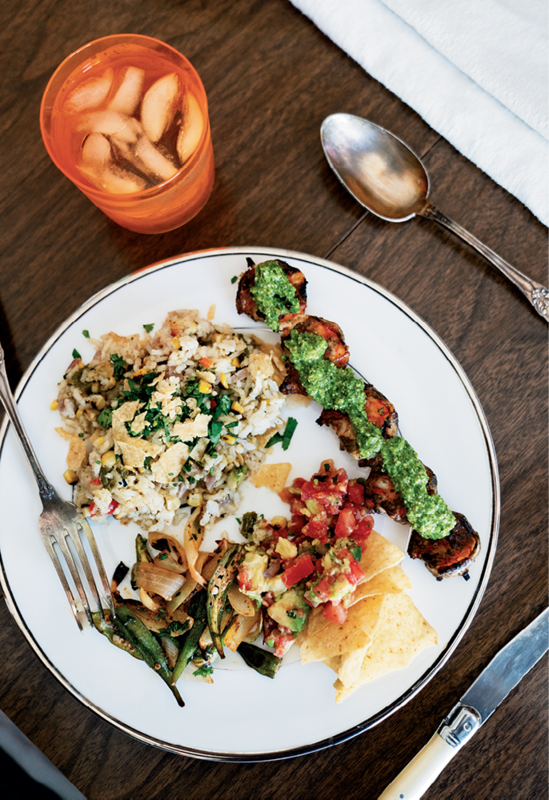 The kids don’t love the idea of poblano chili peppers, but they like everything else in the dish, so they’ll eat the whole thing.” Spiced and roasted okra rounds out the family’s warm-weather dinner plate. When the Moreys do sit down together, at least for supper every Sunday, the five make a focused effort to connect. If the talk doesn’t naturally flow, the girls are nudged with conversation starters pulled from a nearby box. 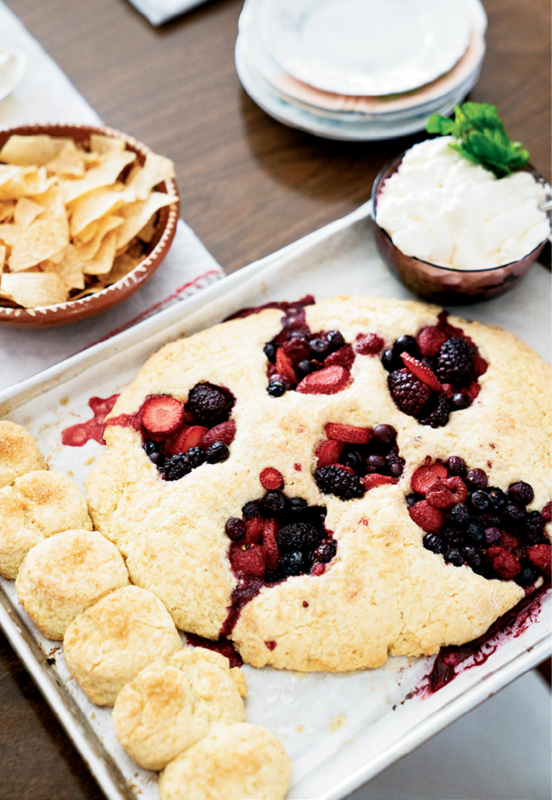 “Mealtimes aren’t just about feeding yourself, but about feeding your soul,” emphasizes Morey, as she rolls out rustic shortcake dough for a dessert that nestles mixed berries into sugary biscuits. The recipe has been passed down through three generations of mothers, and although each new batch tastes slightly different, it gathers the family around the table all the same. Works: She’s the owner of Callie’s Charleston Biscuits and Callie’s Hot Little Biscuit. Restaurant Rules: “When we go out, the kids aren’t allowed to order off the kids’ menu,” says Morey. Their favorite spots are Red Drum, Rue de Jean, and La Pizzeria. Check out Carries recipe for Lime Zest Grilled Shrimp here.